Helen here! How exciting to usher in the New Year with a canvas tutorial to create an inspirational piece of artwork for your home or craft room! I love the chalkboard style you see in so many home decor pieces in the shops and I just knew by mixing and matching my Faber-Castell Design Memory Craft® products I could show you how to achieve the look yourself! In the tutorial I will show you how to use PITT® Pastel Pencils to achieve chalkboard lettering and to add the details to the flowers that adorn this canvas. You will also see how to use Gesso to add that chalk dust to the Chalk Board Painted frame. So lots of fun for you to usher in the New Year in crafting style! Just look at those lovely pearl details that were added to the centre of the flowers using Texture GemsTM. If you would like the pattern for the quotes I used on this canvas then please email me. Click on this link and you will find my email on the right-hand side bar of my blog. I really hope you enjoy the tutorial and would like to take this opportunity to wish you all a very Happy and Healthy New Year with lots of time to create in 2016! Hi, my name is Helen and I love to share my crafting journey on my blog, ‘The Craft Project’ and for the past few of years on my YouTube Channel. I am at my happiest when designing lovely projects to teach to other crafters. As well as sharing my tutorials on YouTube I also sell online workshops for larger projects from my ETSY shop. I am thrilled to have this wonderful chance to be part of the Faber-Castell Design Memory Craft® Guest Design team and to share projects with you all. Some of you that know me will know I am also part of the Rubber Dance Design Team (a Norwegian Stamp company). I am very lucky to have a very supportive and understanding family, a husband and two sons who always cheer me on in my creative adventures even when their tea is late!……oh, and I mustn’t forget our huge golden retriever Comet who likes to try to scare off the postman when he brings me happy crafting mail!!! Hello, it´s Denisa. Today I´d like to share with you my handmade magnets. They´re made of ordinary jar lids. I wanted to spruce up my kitchen a little bit because it´s quite small and the only place for some flat decorations is my fridge. So decorative magnets were the right thing. Hello everyone! Hee Sun Kim here and I am excited to be sharing FABER-CASTELL DMC my first GDT post. I would like to share Zentangle using the PITT Artist Pens. Various sizes are very useful when working Zentangle. Hi everyone! It's Lisa back on the blog to share a cool card to bring the New Year in style using all kinds of the Textural Accents in fun ways that you may not have thought of before. Let me show you the card and then we'll get started! Hi everyone! Carisa here. 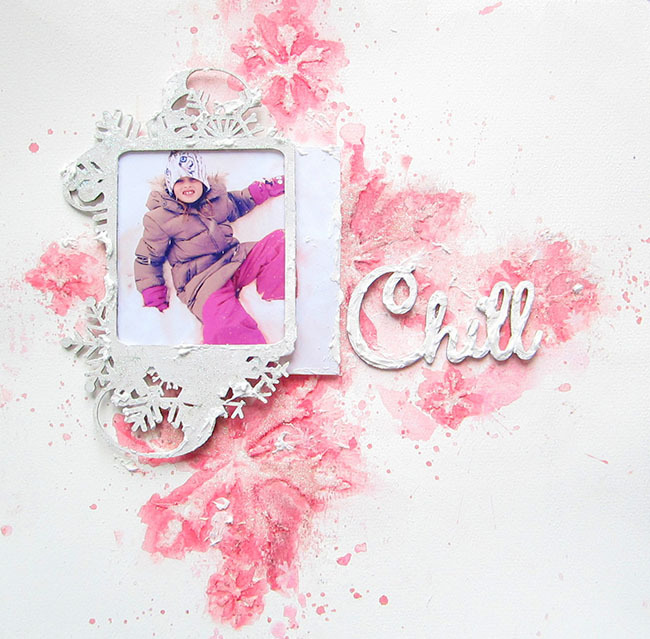 Today I'm back to share with you a pretty mixed media canvas using primarily Faber-Castell Design Memory Craft® Gelatos® Colors. I was inspired by the pretty papers I had just received as well as the rub on from the collection. I wanted to see how it would work over a background made with Gelatos® Colors. I pulled out Butter Cream Gelatos®, Kiwi Gelatos®, Aqua Dolce Gelatos®, Earl Grey Gelatos® from the Pastels Set and Iced Currant Gelatos® from the Metallics Set. I started out by covering my entire canvas with Gesso and adhering pattern paper with Gel Medium. Then I added Gelatos® Colors using one of my favorite methods by scribbling a lot of color on and spritzing with water then letting it drip down the canvas. After drying that with a heat tool, I applied Gelatos® Colors through a stencil from the 101 Collection using a baby wipe. I then added the rub on and coated it with a thin layer of Gel Medium to protect it for coloring later. I also added some Texture Luxe through a stencil to add more texture and tie in the gold from the rub on. I hope you enjoyed this mixed media canvas using two of my favorite techniques with Gelatos® Colors. You can find Carisa blogging at Inky Fairy Designs and Blitsy as well as follow her on instagram and YouTube where she shares works in progress and process videos. Her work has been published in magazines such as CardMaker, Stamper's Sampler and Scrapbook and Cards Today . Who didn't get a chance to send out Christmas cards this year? Me either. But we still have time to send greetings to our loved ones by sending out New Year Greeting Cards! And this simple technique for creating the look of birch trees in a snowy woods is the perfect project to create unique, homemade cards. Of course, if you miss the New Year mailing deadline, these note cards would also work for Winter stationery. Maybe even Holiday Thank You cards? Aloha Guys! This is Joyce from http://enjoyscrappin2 and I'm excited to share this Photo transfer I did on a canvas. I was a little nervous doing this project, since it was my first attempt at photo transfer. It's not perfect but I think it turned out ok :) I've use various products from the Faber Castell Design Memory Craft® line and I hope you enjoy this project as much as I did. Thank you so much for stopping by and I'll see you guys later. Thanks again.